Bitcoin has settled in the $5k range. This week with Bitcoin volume increasing at exchanges the price has crept up and is currently hovering at $5,200+. Cryptocurrency Prices & Top Stories each morning. 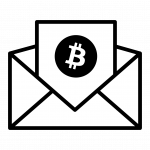 Bitcoin Daily is delivered to your inbox each morning, we find the top 3 stories and offer our expert analysis & highlight current cryptocurrency prices. Not convinced? Check out our latest newsletter. We help you find the latest Bitcoin price, Ethereum price, EOS price along with the top 20 cryptocurrency prices by market cap. You can also compare it to other assets including the S&P 500. We also have historical bitcoin charts comparing the price of bitcoin to USD along with bitcoin price predictions. The price of Bitcoin is constantly changing and is closely monitored by a number of banks, financial institutions, and retail investors. Our website shows you the average price of Bitcoin across major exchanges in the currency of your choice, with updates every 30 seconds. Contrary to the previous year, 2018 saw a prolonged bear bias for the major cryptocurrency. However, following the closure of a 10-month long price wedge, Bitcoin fell from as much as $6,700 to below $3,700 within the single month of November. 2017 was a great year for Bitcoin price-wise, but the bullish price action went parabolic in the last few months of the year. Between November 1 and December 17, Bitcoin’s price skyrocketed from $6,600 to its All Time High of over $20,000 — a more than three times increase. Following the currency’s recent rally, there was bound to be tension in the Bitcoin price in the first months of 2014. This tension broke out when news aired that cryptocurrency exchange Mt. Gox had been hacked, causing the price to drop from around $800 to below $450. Only at the start of November 2017 did Bitcoin recover to its highs from earlier in the year, and this marked the beginning of one of Bitcoin’s most notable bull runs. By the end of the month, the price had quadrupled, although it stabilized around the $700 mark by the new year. In early April 2013, Bitcoin was trading for as much as $237. Overnight, it fell to just $67. This seventy-plus percent drop hit the market with a lasting effect, as it would take over six months for the price to recover to previous levels. The price of Bitcoin is determined by how little sellers are willing to charge (the ask price) and how much buyers are willing to pay (the bid price). When these prices overlap, a trade occurs representing the current price at which Bitcoin is changing hands. How often does the price of Bitcoin change? The price of Bitcoin is constantly changing, with every new trade that is made. Our platform updates the price information every 30 seconds. The cryptocurrency price data on BitcoinPrice.com is based on CryptoCompare’s API. The data is an aggregate of cryptocurrency exchange prices from around the world. Due to market inefficiencies, it’s possible that Bitcoin is traded for different prices at the same time in different parts of the world. This discrepancy can increase if it becomes harder for buyers in a certain geographical location or using a certain currency to buy Bitcoin. What is the difference between bid and ask prices? The bid price is the price at which buyers are willing to buy Bitcoin, and the ask price is the price at which sellers are willing to sell Bitcoin. A trade only occurs, thereby changing the price of Bitcoin, when these prices overlap. The big record book or ledger is called a blockchain. The file size of blockchain is quite small, similar to the size of a text message on your phone. Every Bitcoin blockchain has three parts; its identifying address (of approximately 34 characters), the history of who has bought and sold it (the ledger) and its third part is the private key header log. The first two parts are quite easy to understand. The third one is a bit complex – this is where a sophisticated digital signature is captured to confirm each and every transaction for that particular Bitcoin file. Each digital signature is unique to each individual user and his/her personal Bitcoin wallet. Each and every trade of Bitcoin is tracked and publicly disclosed, with each participant’s digital signature attached to the Bitcoin blockchain as a confirmation. These trades can be found at blockchain.info. This also means people can see the history of your Bitcoin wallet which is a good thing because it adds transparency and security. Also, it helps deter people from using Bitcoins for illegal purposes. The integrity and chronological order of the blockchain is enforced with cryptography. In addition to archiving transactions, each new ledger update creates some newly-minted Bitcoins. The number of new Bitcoins created in each update is halved every 4 years until the year 2140 when this number will round down to zero. At that time no more Bitcoins will be added to circulation and the total number of Bitcoins will have reached a maximum of 21 million.